Jason Vale is the Juice Master. This title has become indisputably his thanks to his succession of brilliant books aimed at extracting the most from your juicer through some fab recipies. 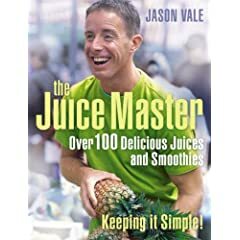 This book, "The Juice Master Keeping It Simple: Over 100 Delicious Juices and Smoothies", is packed with recipes which are tasty, delicious and can help keep you in trim. Jason Vale's recipies are perfect for detoxing, healthy living and slimming - he helped Jordan lose 2 stone in weight. If you have a juicer, then this book is a great little investment to accompany it. Check it out at Amazon and see how many people have given it five stars! Happy to talk to you about juicing if you want to know more about Juice Master. Juicy hotline is 0845 130 28 29 and just ask for me.